Departure of your tourist bus -Premium service- from Lima to Paracas, approximately 3 hours and a half ride. Upon arrival you will be driven to the Paracas' deck. We will board a motor-boat to Ballestas Islands, where you will enjoy the sights and sounds of such fascinating Peruvian coastal wildlife as sea lions (tourist-friendly), Humboldt penguins, and an endless number of migratory birds. Along the way, there will be ample opportunity to marvel at the Candelabro, a mysterious and huge geoglyph that stands watch over the Ica coastline, and to listen to the islands’ history, as recounted by knowledgeable guides. In the afternoon transfer to Paracas' bus station to continue to Nasca City. Departure of your tourist bus -Premium service- from Paracas to Nasca, approximately 3 hours and a half ride. Upon arrival transfer from the bus station to your hotel. Enjoy the sunset and a dip in the pool at your hotel. Explore the beauty of the Paracas sand dunes and gaze in wonder at the enigmatic Nasca Lines. Many theories have been formulated about these lines and incredible designs, some almost 300 meters long,… runways for alien spacecraft, lines of a giant seismograph… however, Maria Reiche, who spent her life studying them, has come up with the most plausible theory: that they form a gigantic astronomical calendar based on the movement of the sun. The lines themselves run from simple designs to complex animal figures like the monkey, the dog, the condor, the spider, the hummingbird, the parrot, among others and additionally the astronaut, the hands, the tree, etc. Come and enjoy this spectacular experience. Back to your hotel you may continue enjoying the nice weather conditions. At appropriate time by night transfer to the Nasca’s bus station to continue to Cusco City. Departure of your tourist bus –VIP service- from Nasca to Cusco, approximately 15 hours ride. Includes dinner and breakfast. REMARK: according to your travel preferences, we may return to Lima City in tourist bus and the next morning we may take a non-stop flight to Cusco. Travel by plane takes approximately 1 hour. According to carrier’s timetable there are many daily flights starting early in the morning and also in the afternoon up to 4PM at most. Transfer Bus Station - Cusco hotel. Approximate time arrival is noon. Free afternoon at leisure to rest or enjoy the best restaurants, museums, cultural places and shops. 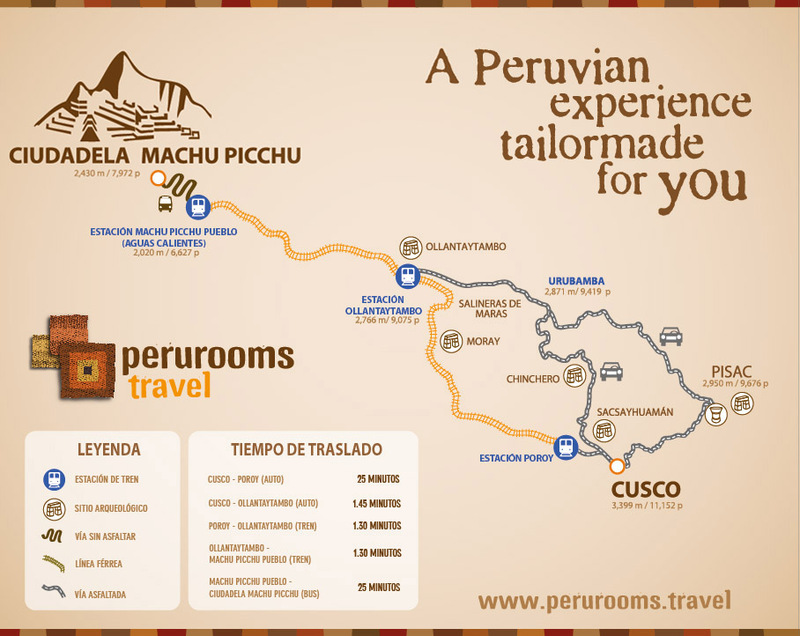 Transfer Sacred Valley hotel – Ollantaytambo Train Station. 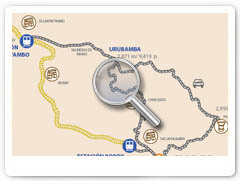 Departure of your train through an amazing route. Arriving to Machupicchu Pueblo (formerly called Aguas Calientes) Train Station, you will be transported by bus to the top of the mountain (approximately 25minutes ride). Start your guided tour to the hidden gem of the Incas: Machu Picchu Citadel. Machu Picchu Sanctuary is one of the most renowned examples of Inca architecture, surrounded by lush cloud forest. Lost in history, it was not discovered until 1911 by the American explorer Hiram Bingham. At appropriate time transfer to Cusco's bus station. Travel by tourist bus enjoying beautiful landscapes and including four bilingual guided stops on the way : Andahuaylillas – called the Sistine Chapel of the Americas-, Raqchi the God Wiracocha Temple -supreme god of the Incas-, La Raya Pass -the highest point of the trip, to appreciate snow-peaked mountains-, and the Pucara Temple. Duration: 10 hours travel time approximately. Note: This tourist bus runs daily and not only includes entrance fees to all described tourist sites but also a lunch in Sicuani at appropriate time. Travel by train with Andean Explorer by Orient Express. This journey includes a gourmet lunch, on board entertainment and afternoon tea. The Andean Explorer has dining cars and a car-bar outdoor observatory. The Andean Explorer is one the most of luxurious and different way of travelling between Cuzco and Lake Titicaca or vice versa. Duration: 10 hours travel time. Note: This train runs only Monday, Wednesday and Saturday; however, from April-October it runs also on Friday . Start a complete day of sailing in Titicaca Lake, the highest navigable lake in the world. Early morning departure for the floating islands of Uros, where the inhabitants still live as they did centuries ago, on floating islands they make with the totora reeds that grow on the lake. Continue sailing towards Taquile Island. This island is a small town inhabited by Quechua speaking natives who have developed both an efficient and original social system as well as a fine hand weaving technique over the generations. Lunch will be served in a local house that serves as a restaurant. After lunch, explore the island and enjoy a beautiful view of Lake Titicaca. Finally, return back to the main dock to take the boat back to Puno. REMARK: depending on your departure time you may add a nice guided tour on route: Sillustani. This complex stands on the shore of Lake Umayo. It is famous for its chullpas, large circular fortified burial towers for the main leaders of the early villages of the Collao plateau. Some are 12 meters high (39 feet), and remarkable for their shape, thinner at the base and wider at the top. 1night in the Lima including breakfast, 1night in the Nasca including breakfast, 1night on route Nasca-Cusco including dinner and breakfast, 3nights in Cusco City including breakfast, 1night in the Sacred Valley of the Incas including breakfast, 2nights in Puno Lake Titicaca including breakfast. - Airfares required: ONLY Juliaca/Lima. NOTE: If you would like to add an extra remarkable outing, you may climb the Wayna Picchu Mountain but please review the following important information: Wayna Picchu. 5 All your queries and requirements are welcome!